Fifty-plus years have passed since Dr. Martin Luther King, Jr. delivered his “I Have a Dream” speech from the steps of the Lincoln Memorial in Washington, D.C. as the African-American community was locked in a difficult struggle trying to secure true equality and freedom. For more than 300 years, slavery was a way of life for so many Africans who were brought against their will to what would evolve as the United States of America, and to other parts of the world. And even when emancipation was finally declared in 1863, it would take another century before America would 'rise up and live out the true meaning of its creed: “We hold these truths to be self-evident: that all men are created equal.” ' Are we honestly able to say that we are fully living that creed today? This piece is my attempt to encourage each one of us to continue to ask the hard questions regarding the legacy of slavery and racism - that legacy with which we live and which we must face from multiple perspectives. 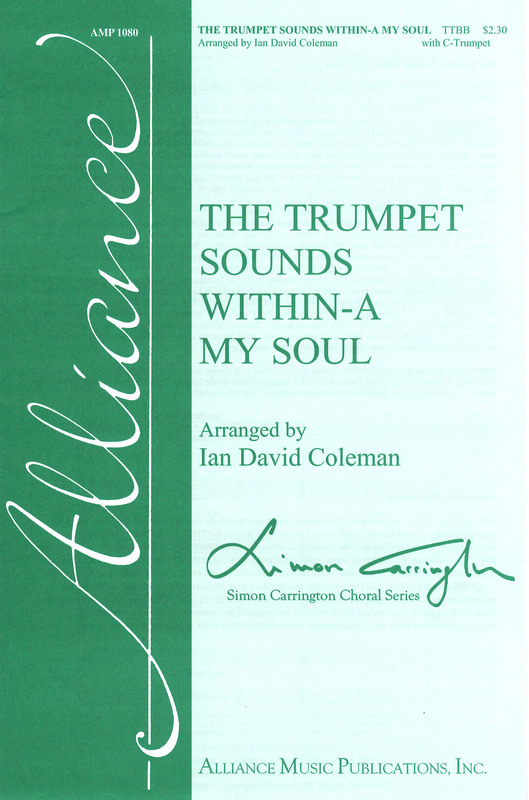 Indeed, in this piece you will hear the hauntingly beautiful spiritual ‘Steal Away’, but you will also hear the trumpet sounding, as it were, within the singer's soul. It is this instrument's role to reflect the inner turmoil of the African-American, on the surface singing ‘Steal Away to Jesus’, but internally struggling with oppression and the constant experience of being told that he or she was less than human, a mere commodity. The trumpet does this by playing pseudo fanfare gestures that contain ‘blue’ notes which pull against the harmony of the spiritual, and by playing a half-step sighing motif. There are also choral textures that have an internal dissonance which the spiritual at times struggles to rise above. Finally, I have also embedded a so-called ‘white spiritual’; specifically the hymn ‘What a Friend We Have in Jesus’. This is a deliberate attempt to cause us to face the irony inherent in the fact that as the African-Americans sang about ‘stealing away’ to Jesus, the white slave owners were proclaiming what a great ‘friend’ they had in that same Jesus. Martin Luther King, Jr. proclaimed his dream fifty years ago. It seems to me that while that dream is noble and right, and is slowly coming into focus, it is still a long way from being fully realized. May we all strive to judge others ‘not by the color of their skin, but by the content of their character’. In the spring of 2017 I was contacted by Jeremy D. Jones and the Miami University Men's Glee Club with the suggestion that I rework the SATB version of The Trumpet Sounds for TTBB. He had been in discussion with Simon Carrington, the series editor for the original version, and they both felt it had potential as a menýs chorus piece. The challenge for me was in taking a piece that had a depth of musical textures within it and trying to place those into a new and lower voice range without losing the overall effect. Simon, Jeremy and I sent a few rough drafts back and forth and I believe what we offer here is an effective reimagining that maintains the essential essence of the original, while allowing for the different timbres of an all male ensemble. We hope you enjoy working on this version and find it effective and engaging as a means to deep and meaningful conversations about some very contemporary issues that find their roots in the American experience.